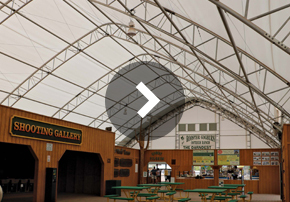 ClearSpan Fabric Structures provides more value than just the average hay shed or hay barn. ClearSpan feed storage barns create a dry environment, so every operation gets the most out of its hay and feed. Each structure can be designed to specific operational needs, and they can be used to store any kind of feed. A storage structure from ClearSpan utilizes unique truss arch design that offers several advantages, including wider profiles without support poles and taller sidewalls. This ensures the maximum amount of storage space and allows equipment to be easily operated within the structure. Like every ClearSpan structure, they come at a low cost per square foot and provide beneficial natural ventilation. ClearSpan can construct the best hay shed or hay storage barn for any feed storage need. These feed and hay barns are not only economical, but also extremely efficient. They provide increased accessibility year-round, and by their design a ClearSpan hay barn is easy to keep clean and well organized. The ClearSpan legacy spans nearly 40 years and includes the highest-quality building storage solutions. The decision to add a hay storage structure may seem like a simple one when the savings of dry matter and quality are considered. However, building the structure can seem like a daunting task. ClearSpan makes that task as easy as possible. ClearSpan has custom, stock and turnkey options, and can provide all the necessary designing, engineering and installation. For farmers who rely on hay to feed their livestock or to sell their supply to other farmers and local businesses, nothing is more important than preserving it in a dry area, free from the elements. Regardless of how hay is bundled, its nutritional value can be significantly compromised if exposed to damp environments. For Gary Knutson, owner of Gary Knutson Farm, outdoor hay storage was no longer a viable option. To learn more about Gary Knutson Farm and their two Hercules Truss Arch Buildings from ClearSpan Fabric Structures, please contact Gary at: KnutsonAngus@hotmail.com. 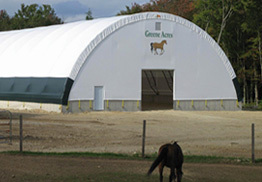 Our hay, grain and feed storage buildings come in fabric, hybrid and metal buildings, ensuring that no matter how you plan on using your ClearSpan structure, there is an ideal option.